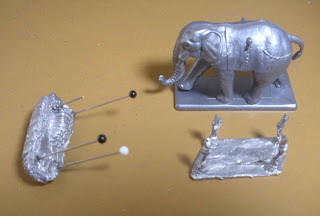 Compared above, are the HäT War Elephant (8023), and the Splintered Light Miniatures Skeletal War Mammoth (UNDE21). The HäT elephant is an African forest elephant which ranges from 7-8 feet at the shoulder, so the size of the figure is right on. The SLM mammoth however looks stumpy and dwarfish even for 15mm. The downward curving tusks are also not very mammoth-like. 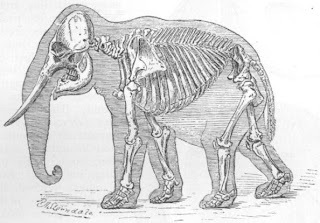 Looking at some pictures of elephant skeletons, it seemed that the SLM mammoth could easily pass for a 20mm mammoth if something could be done about its legs. A mammoth can be anywhere from 9-15 feet at the shoulder. Elephant: Shorter legs, so the rib cage appears lower to the ground. 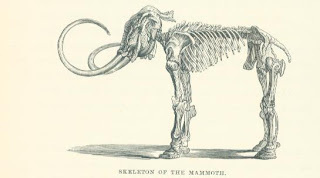 Mammoth: The legs are long, so the rib cage appears higher. Using my standard technique to embiggen figures, I cut off the legs where they joined the body. I then drilled holes in the body and glued some pins in place. I compressed the tibia to lengthen the bones, and then adjusted the pins to get the height I wanted for the skeletal mammoth. Instead of my standard procedure of drilling and gluing, followed by Kneadatite, I decided to try something different to re-attach the legs to the body this time. The drilling process on thin pieces like limbs and bones is difficult and time consuming, while the glue and Kneadatite join is only just adequate. What I decided to do this time, was to join the parts with solder. It took a few attempts to get the soldering just right, but it turned out quite well I think. I believe that part of the secret is that the two ends you are joining should be hot, though you have to be careful about melting your miniature. When the metal is cold, the solder just beads up, and will often just roll away. Solder seems to leave a solid join that does not have the slight flex of a Kneadatite join, so I like it a lot better. I'll finish by building up the bones with Kneadatite. In addition, the SLM mammoth comes with a choice of three different heads, so I'm going to drill out the neck and install some rare earth magnets to allow swapping out the skull whenever I want a new look for the mammoth. Thanks for the tip. Despite having owned a soldering iron for many years, I think this is the first time I've used it to actually solder something. I am keeping this blog in an effort to track my building progress, document my work, and hopefully to maintain motivation to finish the projects I have started. My scale of choice is 1/72, and the projects I paint, build, and collect cover a multitude of subjects from historical to fantasy and science fiction. There's not much to say about myself. I work in a cubicle and stare at a monitor all day long. For recreation I paint miniatures, build models, and practice kendo. Всё-таки "парадные" машины для меня - самое сложное! WAR OF THE RING- An army for Mordor.. and Isengard! Second World War comparisons on "World War 20mm"
Dawn – Rise of the Occulites Kickstarter is Live!